WASH is a spoken word/electronica collaborative project between Warren Daly, Alex Leonard, Scott Bywater and Hal FX established in Phnom Penh in the first half of 2013. 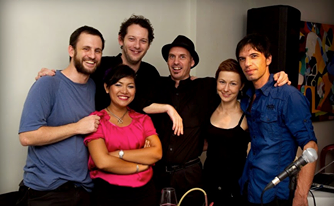 WASH performed their first collaboration Triptych in Phnom Penh on April 24 at Java Cafe and Gallery and on May 10 at Equinox Bar. An edited version of the work can be found at Radio Free Equinox. Limited edition booklet and digital album download is now available… 18 page colour booklet & 1.5 hours of music. http://washcollaboration.bandcamp.com/merch/wash-triptych-colour-booklet-album-download or message me if you live in Cambodia. Download full text of Triptych. A subsequent work, The Next Horizon, was first performed at Doors, Phnom Penh, on 20 August as part of Vibe Music Festival. This was followed by performances at META House, Phnom Penh, on 14 September and Equinox, Phnom Penh, on 25 September. A!, Chhan Dina (painter), W!, S!, Adriana Snochowska (painter), H!.